If you are looking for this year's World Championships scores then look HERE, otherwise continue reading on this page for a complete run-down of past title winners, genre wins, average scores, etc., etc.. It's an almost unalloyed record of English success, although Mark Grant does fly the flag for Wales! First up, the honour roll for all championships since the very first, back in 2003! Next up is a breakdown of who finished top in each genre in every WQC heat across UK venues combined. Players and scores shown in bold text on a darker background indicate theirs was a global top score in that genre (albeit shared in some cases with 'overseas' players). Here now a tabulation of the top UK (and in some cases global) genre scores, with averages for each genre over the years (shown at the foot of the table) and, down the right hand side of the table, the average of all genres in each particular year. 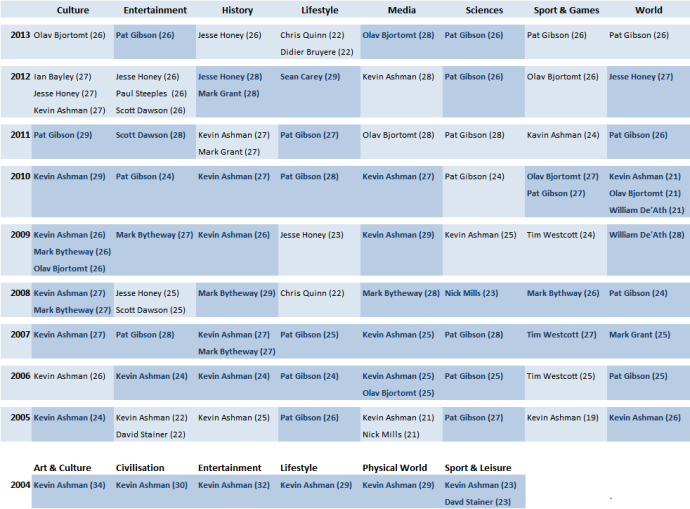 Finally we have a table showing all the genre wins by quizzer at UK venues (combined) with details also of their global triumphs, where appropriate. The table is arranged in descending order with preference given to global triumphs over UK wins - albeit in some cases people have eventually had to be separated by reference to given names. 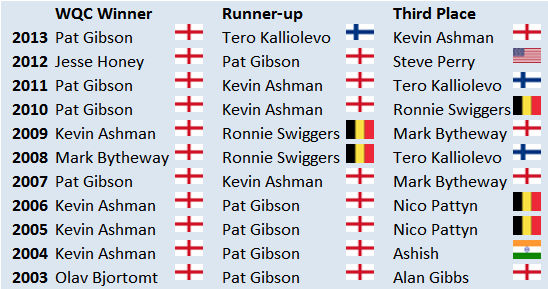 This last table indicates that - and while Pat Gibson rivals him for overall titles and has himself amassed a staggering number of wins - Kevin Ashman has clearly been the most dominant player over the lifetime of the competition. Please note, in the case of 2004 results, 'Civilisation' has been equated to 'World' and 'Physical World' to Sciences'. In each case they are broadly analogous.